Renault Nissan has laid out its plan for the next four years. The carmaker is planning on launching no less than 10 autonomous cars by 2020. These car fitted with autonomous technology will be available in the US, Europe, Japan and China. Furthermore, Renault Nissan has expressed that it does not want to cater to a niche audience, but rather make the cars mainstream, mass-market at affordable prices. Autonomous or self-driving cars has been the hottest topic in the automotive industry recently. The who’s who of carmakers are slowly shifting their attention to autonomous technology, and now Renault Nissan wants to join the bandwagon as well. The ultimate goal here is a self-driving car. Brands like Tesla have already started rolling out semi-autonomous vehicles, Google and Apple are also working on self-driving cars, and it’s only a matter of time before the technology is fully ready and capable. Coming back to Nissan, the company is planning to add a “single-lane control” feature to cars this year for hands-free driving on freeways and in heavy traffic. The company plans to improve the system in two years time to allow it to navigate between lanes on a highway and autonomously avoid any collision. By 2020, the company hopes the technology will be perfected to include city intersections and urban traffic. 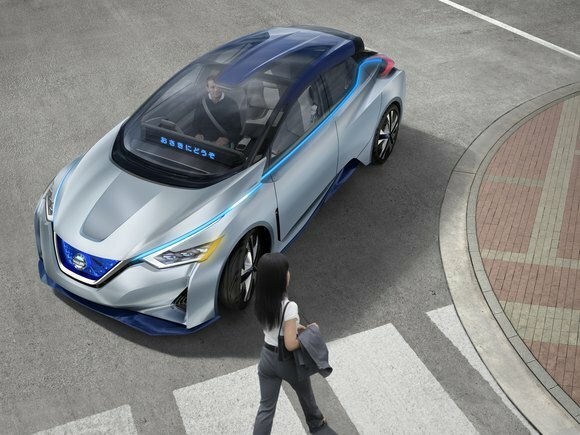 Nissan showcased its IDS concept electric car with autonomous technology at the Tokyo Motor Show last November. The concept featured a LED strip along the dashboard that could be used to display messages for pedestrians. The car would also automatically stop if a pedestrian is closing the road and would indicate that it is aware and will wait for them to cross the street before it continues (as seen in the image above).